Posted November 9, 2016 by David Binet & filed under News, Reel Blog. France’s UGC helps pioneer a new program to strengthen the diversity of programming at the movies. Ideally situated on the Avenue Champs-Élysées in Paris, just west of the famous Arc de Triomphe, sits the business offices for UGC, one of the country’s leading exhibition and distribution companies. The view from the top floor, suffice to say, is remarkable. It also symbolizes a philosophy now inherent within the company. A glance from one office window reveals a mesmerizing panorama spanning from the Eiffel Tower to the iconic arch at Place de l’Étoile. It’s old Paris in its purest vista. The view from the opposite office window faces towards La Défence, a modern business district full of glass high-rises and steel skyscrapers. It’s new Paris in shimmering glory. This visual dichotomy epitomizes UGC’s focus on maintaining tradition while also looking towards the future. And that variety manifests itself at the multiplex. It only takes a casual glance at the show times in Paris to notice the array of options available for moviegoers in the French capital. With 206 million tickets sold in 2015, France is the largest movie-going market in Europe in terms of admissions and a close second next to the UK in terms of box office. What makes this movie-going figure intriguing is that it is nearly 80 percent higher than it was 25 years ago, when France bottomed out by hitting a historically low level of admissions. The market’s rebound has been achieved, in part, by collaboration between the film industry’s segments in establishing admission-driving policies. Another such example occurred this May, when trade bodies representing production, distribution, and exhibition signed an agreement with production and distribution companies to help strengthen the market by putting in place best practices to support wider diversity in programming. The agreement signed in May between the industry’s trade bodies suggests that UGC’s philosophy on diversity is shared by others in the industry. The two principal dimensions to the agreement that affect exhibition aim to optimize screen counts and showtimes for all films on the market. Firstly, all stakeholders agreed to limit the number of screens dedicated to any given film on any given day. The underlying idea is that it is not good to overexpose a movie in a short period of time. “Cinema cannot be summarized as ‘Take the money and run,’” explains Sussfeld. “A movie needs time in theatres, it is part of its value. Putting a blockbuster in too many screens and then getting rid of it two weeks later is not good for anyone!” Additionally, exhibitors take a commitment to offer a pre-defined number of show times for limited release movies that would otherwise have a hard time to make it to the big screen. The strategy seeks to limit the overexposure of blockbusters and applies equally to French and U.S. movies alike. Behind this approach is the idea that a solid theatrical market requires a long term strategy that includes diversity of content rather than the maximization of box office week after week. According to Sussfeld, there is no successful diversity strategy without a consistent commercial policy. In UGC’s case, this policy is based on a strong loyalty program and an unlimited subscription pass that aims to help viewers discover new films. 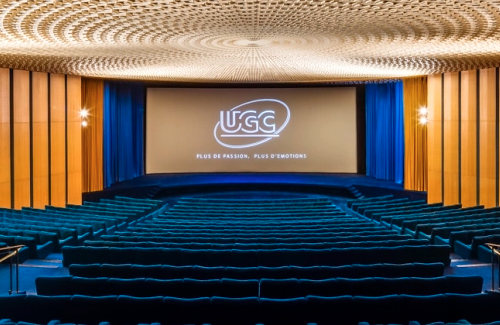 UGC’s unlimited pass is particularly designed to reinforce the likelihood that moviegoers will try different types of movies and adopt an attitude of discovery in future cinema visits. As a result, UGC is able to retain their fair share of blockbuster admissions while over-performing on limited release movies, helping them balance low attendance periods. Sussfeld’s main concern is that this model hasn’t yet been adopted outside France, making it fragile by definition. With the support of other markets through a similar approach, Sussfeld believes there would be a better understanding of the specificities of movie-going in each market. Leave it to the French to teach us a thing or two about maintaining a cultural commodity. At the end of the day, however, the model’s long term sustainability cannot exist without a solid slate of releases. Year-to-Date admissions in France, +4.1 percent at the end of August, suggest the market hasn’t encountered any difficulty adopting this new model. The question moving forward now becomes, will any other markets venture to attempt something similar?